The hotel staff was very friendly when I asked for another room due having been accidentally registered as a smoker. I was moved to a non-smoking room at 11:30 pm. upon my arrival. The hotels hospitality room with drinks and snacks was exceptionally clean and well stocked! The all Suite hotel is great. The rooms had a strange smell to it. Great deal from priceline. We looked for hotel in SW Houston, and this was perfect. Staff was friendly, and hotel was very quiet. I would go here again. Good location. Nice rooms. Friendly staff. The pet-friendly Candlewood Suites Houston - Westchase is located in Houstons Westchase business district and comprises 123 suites designed for the extended-stay business and pleasure traveler. Items included with the room rate at this three-story hotel are high-speed Internet access, a guest laundry, in-room coffee and local telephone calls. The property is located off Beltway 8. Area landmarks and attractions include Reliant Stadium, the Toyota Arena, Minute Maid Park, Space Center Houston, Houston Zoo, the Sam Houston Race Park, the Bollywood Cinema and shopping at the Galleria Mall which is five miles from the property. The suites have a kitchenette with coffee and tea making facilities, refrigerator with icemaker, microwave oven, stove, dishwasher and toaster. Other amenities include a work desk with high-speed wireless Internet access, two dual-line telephones with voicemail and speakerphone, television with cable news and movie channels, stereo, alarm clock-radio, iron and ironing board and a hairdryer. Non-smoking suites and handicap accessible suites are available. This hotel had a fitness center and a picnic area with barbecue grills. The 24-hour front desk has safe deposit boxes and information on area landmarks and attractions. Other amenities include a guest laundry, same-day dry cleaning service, a car rental desk, airline desk, a business center with copy and fax machines available for guest use, a newsstand, daily housekeeping and ice and vending machines. The Candlewood Cupboard has a variety of breakfast items, snacks and frozen entrees all priced under $5. Restaurants nearby include an IHOP, Red Robin, Cheddars, Tokyo One and a Chilis. 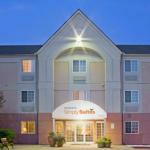 This Candlewood Suites gets many repeat customers which is a great recommendation. And the reasons they return to this Houston hotel are the friendly and efficient service they get from the front desk and the affordable rates. The suites are fully-equipped with very comfortable beds and they are spotlessly clean. The location is good, close to the expressway system, and many first-time visitors say they will make this property their hotel of choice on future visits to the area.